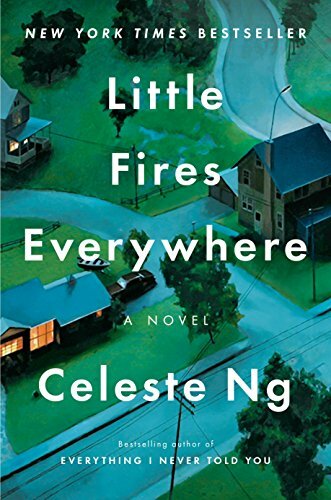 With her bestselling debut Everything I Never Told You and now her second novel, Little Fires Everywhere, Celeste Ng has indisputably proved that she is a master at mining the relationships between mothers and daughters in all their pain and love. Learning to let your children go—to be satisfied with an “occasional embrace, a head leaned for just a moment on your shoulder . . . was like training yourself to live on the smell of an apple alone, when what you really wanted was to devour it, to sink your teeth into it and consume it, seeds, core, and all,” muses one of Little Fire’s main characters, Mia Warren, a photographer and single mother who has spent the past 15 years schlepping her now-teenage daughter, Pearl, from town to town across the U.S., never staying more than six months, never carrying more than her aging VW Rabbit can hold. In this new novel, Ng probes the maternal bond in almost every possible configuration—traditional two-parent families, adoption, abortion, abandonment, surrogate motherhood, single-parenthood—and in a range of ethnic and social classes, from a Chinese immigrant scraping by at a minimum-wage restaurant job, to a Wall Street-WASP couple desperate for a baby. These bonds spool out through a half-dozen page-turning subplots, starting with arson on page one. Because Ng is so talented, it is a surprise and disappointment that two characters at the center of this novel are one-dimensional: the upper-middle-class mother almost always referred to as “Mrs. Richardson” (even when she’s a schoolgirl) and Shaker Heights, the planned suburban community in Ohio where Ng grew up and where most of the action takes place, which is as much a character as any human in Little Fires. Conformity, hypocrisy, rigidity: bad. Okay, we get the message. The lives of the Richardson and Warren families intertwine when Mia and Pearl wander into Shaker Heights in June 1997 and rent an apartment from the Richardsons. Attending the same high school as all four Richardson offspring—who range in lock-step age from freshman to senior—Pearl is entranced by their stable, luxurious lifestyle, hanging out at their sprawling house after school nearly every day. Although she is supposedly best friends with one son, she becomes dangerously attracted to his older brother. At the same time, the youngest Richardson—the rebellious Isabelle (or Izzy)—feels a reverse tug. Chafing at her mother’s constant criticism, Izzy spends all of her spare time back at the Warren apartment with Mia. Driven by unacknowledged jealousy, Mrs. Richardson uses her long-dormant journalistic skills to investigate Mia’s mysterious past. Meanwhile, Shaker Heights’s polite residents are unaccustomedly divided by a custody battle over the Chinese immigrant’s infant daughter. Who wouldn’t keep reading this book until the final page?